About a week or so ago, I posted a homebrew scenario I had made using the All Things Zombie maps with the Heroes of the Gap counters. After lots and lots of playtesting, I think I've finally gotten it to the point where it's balanced out a bit. Briefly put, the Soviet player gets the Nicaraguan forces from Line of Fire 12 along with the Spetsnaz against the might of a few defenders from the Texas Army National Guard and a group of grim but heavily armed and determined police and civilians. 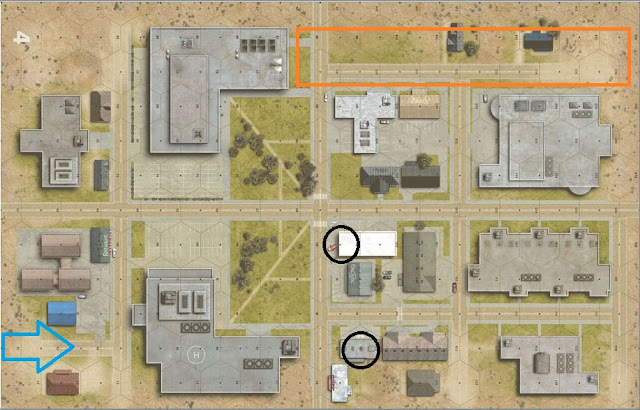 The scenario takes place during the Soviet invasion of the United States and the Russians are trying to capture the police station and a military command installation in the town of Chaparalle Falls, TX. As per tradition in my household, we opened one Christmas gift on Christmas Eve and I was very happy to unwrap a new copy of "Into the Breach", an expansion for World at War module, "The Untold Stories". ITB has been out for a while now but that's never stopped me from doing unboxings before. The box cover is pretty cool and has some very nice artwork by Marc Von Martial. Into The Breach basically includes lots of American units and the cover reflects that nicely enough as a pair of Abrams tanks creep through the dark woods. This cover is a pretty substantial departure from the previous WaW module cover art. The old use of white space and banners is gone, there are no photos on the front of the box, and the art appears hand drawn. It's a nice change of pace from the old covers and I like it. Below is an LnL scenario based on the upcoming World at War module, "America Conquered", coming at some point in 2013. I've tweaked and play tested this one countless times over the past while and I think it's ready for consumption at this point so here goes. As always, any feedback welcome. Background: The meager forces left of the Texas National Guard stationed in Chaparalle Falls, TX, bravely faced the onslaught of Nicaraguan army regulars and Soviet Spetsnaz invading their small town. The local police and more than a few locals also joined in its defense, trying to keep the Communist Allies from taking over the town hall and the local police station. For the Nicaraguans and the Soviets, this place was a dot on the map but for the people of Chaparalle Falls, it was their home and they would hold on to it or die in the attempt. I have just finished playing turn 1 of Phase Line Smash, GDW's solitaire game of the 1991 Gulf War, featuring the US VII Corps. I'm kind of blown away, to be honest. Contrary to my first impressions, the game is not overly complex. Although the rules are certainly dense in some places, they are pretty intuitive and easy to grasp after you play through them a couple of times. Chadwick and Nilsen were pretty careful about not including too many exceptions or long lists of die modifiers, which means that you don't have to keep referring to the rulebook every time you want to move a counter. An index certainly would have helped new players a bit but the tables and charts are okay. Phase Line Smash: Turn 1 - Tac Air! Setting up Phase Line Smash took the better part of an evening and I started to get really excited about playing the game. I'm bound to make some mistakes but here's what I've already learned just from the setup. 1.) This game is gonna be on your table/floor for a few days so keep it somewhere safe. 2.) Use the Holding boxes for the Coalition units. Huge stacks of brigades are difficult to sort through on the map at setup. 3.) Some of the engineer units for the Coalition forces have only the corps set as the parent unit. I believe these can be attached to any US division or can be left as corps level units. Once the game is setup, it looks pretty impressive. Since I'm new to the game and I have no idea what I'm doing yet, I've decided to just throw myself in here and see how it works. First up is the weather phase, which is skipped for the first turn in the historical scenario. It's the afternoon of Feb. 24th, 1991 and the weather is overcast. Twenty years ago, GDW released "Phase Line Smash", an in-depth solitaire treatment of the US VII Corps involvement in the Gulf War during the 100-hour ground invasion. Frank Chadwick designed a game that lovingly attempted to model part of the ground invasion, including rules for fratricide, weather, a multitude of terrain, breaching operations, and close air support. The basic rulebook tops out at 53 pages. Line of Fire 13 Has Arrived! The latest issue of Line of Fire landed in my mailbox yesterday so I thought I would open it up and check out what this thing looks like in its paper form. First off, the issue arrived in Japan without a bend, fold or scratch. I have the plastic baggie that the magazine comes in to thank for that. Taking it out of the bag, it looks like a big departure from previous LoF issues. For one, this thing has a nice thermal bind. This is quite a step up from previous issues with staple binding. The thicker cover is also extremely colorful and adds to the nice overall quality of this magazine. The inside of the magazine still has the same good stuff you've come to expect from LnLP. Plenty of reviews, scenarios, previews of upcoming games, etc. This marks my 100th post on this blog and I thought for a long while about how to make it a little special. The first wargame I ever bought was World at War: Eisenbach Gap and "First Moves" was the first scenario I ever played and for that reason, among others, it remains one of my favorite scenarios to haul out after a long day at work. I'm not sure what it is about this scenario that keeps calling me back but it could be the beautiful simplicity of it, the raw power of T-72s vs. M1 Abrams tanks or the fact that it's the very first step into the World at War universe. In any case, I do remember doing a very short AAR of this scenario a while back and I've always thought that it deserved better. So here it is - a fully detailed AAR of First Moves for Eisenbach Gap.